The Clothes Bar carries a variety of fashion forward-fitness apparel that is made to withstand your most sweaty workout. The high tech fabrics are light weight, breathable, whisk moisture and reduce odor.We are a Lucy partner and also carry Lorna Jane, Hard Tail, Tasc, ALO. If tennis is your sport , let us be your headquarters. We have matching tennis outfits and separates, all specific for tennis. We feature Tail, JoFit, Fila, Wilson, and Lija. We also carry tennis shoes for tennis and running-ASICS, Wilson , and Prince . We also carry yoga and pilates mats, tennis bags, and workout bags. We also can help you out if you have forgotten something for your workout, socks, shirt, shoes, flip flops all for men and women. The Clothes Bar has you covered for your life outside of the gym, too. 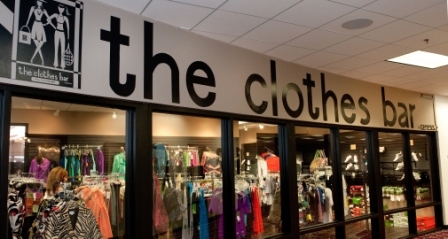 If you need something new and trendy to go to lunch or dinner in, check out the Clothes Bar. We also have lots of accessories, scarves, jewelry, handbags, etc. Need a gift, we have many to choose from and have free gift bagging. Look for our special store wide sales around holidays and twice annual Sale on Sale sidewalk sale.